Baby Lucas Named the 2018 Spokesbaby! FLORHAM PARK, NJ (Feb. 7, 2018) – Today, early childhood nutrition leader Gerber announced a sweet new edition to the Gerber Family with the results of their eighth annual Gerber Baby Photo Search. 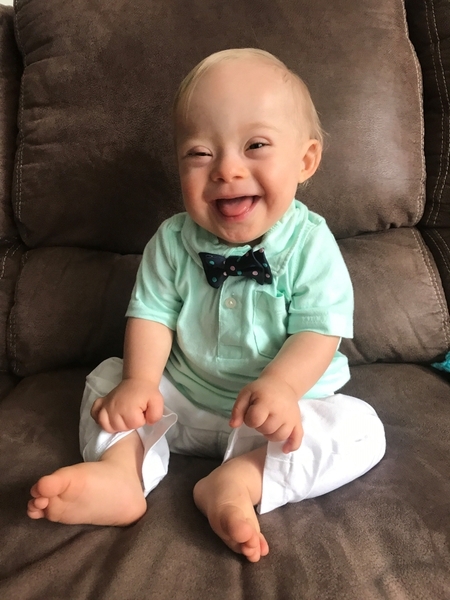 Baby Lucas from Dalton, Georgia won the judges over with his glowing and giggly smile and was chosen among more than 140,000 entries. As the Grand Prize winner, Lucas’ family will receive $50,000, he will be given the coveted title of 2018 Gerber Spokesbaby and take a front seat on Gerber’s social media channels throughout the year. Gerber has received countless photos over the past 90 years from parents who think of their little ones when they see Gerber’s iconic baby logo. In 2017, the logo was refreshed to pay homage to the original black-and-white sketch of the first Gerber baby, Ann Turner Cook, who just celebrated her 91st birthday. Inspired by the adorable baby photos received from proud parents, Gerber launched its first official Photo Search in 2010 and has continued celebrating babies and toddlers every year since, not only through Photo Search but through its real, delicious and nutritious food for babies and expert tools and services for parents. In addition to the Grand Prize winner, Gerber honored twelve additional winners in the “Giggles and Wiggles” and “Best Dressed” categories. The “Giggles and Wiggles” winners will receive $500 and a year’s supply of Gerber and Purina products. The “Best Dressed” winners will receive $500, courtesy of Gerber Childrenswear, $250 worth of Gerber Childrenswear and a year’s supply of Gerber products. Photo of the winners and additional information about Photo Search 2017 and Gerber can be found by visiting Gerber’s Facebook Page. Gerber was founded in 1928 in Fremont, Michigan. Gerber Products Company joined the Nestlé family on September 1, 2007. Gerber Products Company is a leader in early childhood nutrition.